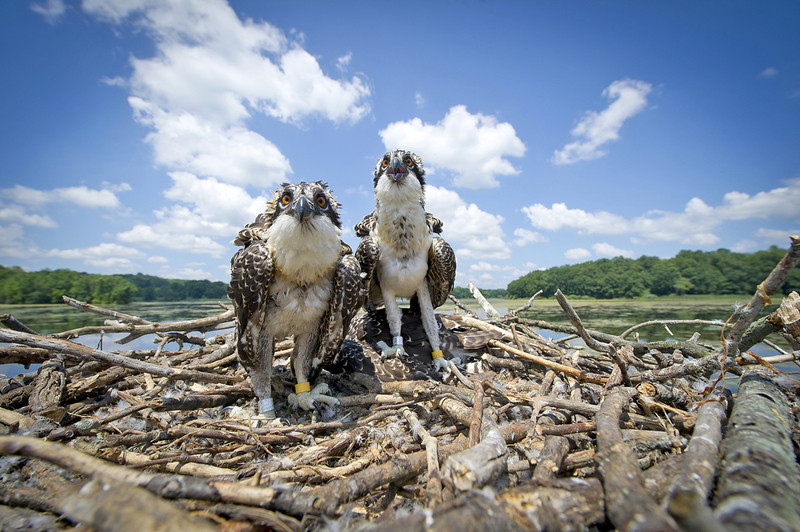 SOUTHFIELD, MI – Three young, southeast Michigan ospreys were fitted with GPS transmitters in July so state wildlife researchers can learn more about their travel routes including where they winter in Central and South America. It is the first time that has been done in Michigan, according to state officials. “This is going to tell us where the birds go,” said Julie Oakes, a wildlife biologist for the Michigan Department of Natural Resources. “It’s going to give us some idea about their survival and whether their route south is through Florida or Mexico. The $15,000 GPS project was funded by grants from American Tower Corporation which purchased two units, and DTE Energy which funded one of the GPS devices. The project is also a partnership with the Detroit Zoo, the Huron Valley Audubon Society and the grassroots Osprey Watch of Southeast Michigan. GPS backpacks were fitted on 5 ½ half week old ospreys. The birds hatched in nests found at Kensington Metropark, Estral Beach near Monroe, and at Pinckney outside of town on a cell phone tower. Ospreys have nested on a number of towers constructed by American Tower, according to DNR wildlife staff. DTE Energy had a pair nest on one of its power poles this year near Pointe. Mouilee State Game Area in Wayne and Monroe counties. The birds there were moved to a nearby nesting platform built by Boy Scouts and volunteers. Ospreys are fish-eating raptors known to nest on dead trees, power-transmission towers and utility-line poles. They were listed as a threatened species in Michigan until 2009. The state’s osprey population has rebounded from a major decline in the 1960’s when its viability was threatened by the pesticide DDT which caused thin-eggshell syndrome and failing reproduction. DDT was banned in 1972. But that recovery was not uniform across the state. Wildlife biologists say they have focused additional effort since 1998 on rebuilding the southern Michigan osprey population. That’s when they began relocating young, northern osprey hatchlings to hacking boxes in southern Michigan. The hope was that the birds would fledge there, imprint on the area, and return to nest after their first migration to Central or South America. A southern Michigan recovery goal of 30 nesting pair was established at that time. That recovery goal has since been exceeded. 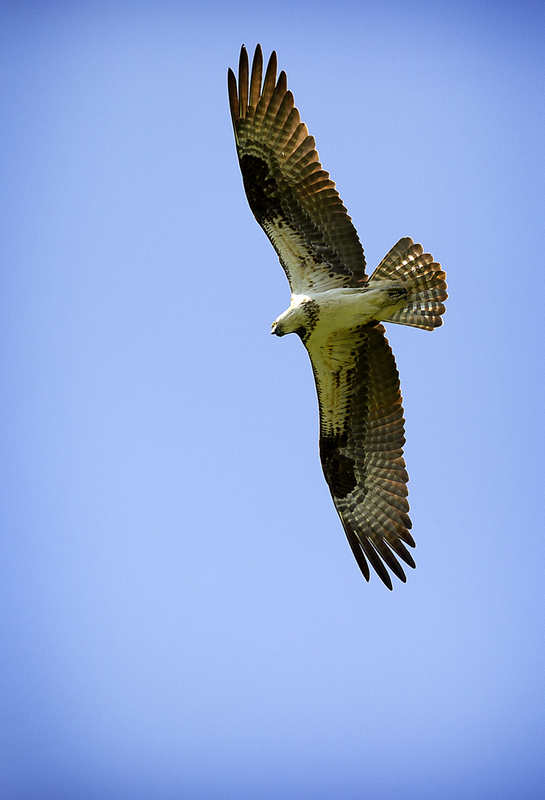 There were 56 active osprey nests in southern Michigan this year, according to Oakes. Most are found in southeast Michigan, but some are found in Barry and Kalamazoo counties. The 2011 Michigan Breeding Bird Atlas shows at least 10 confirmed breeding pair in southwest Michigan and more than a dozen “possible” sites. Oakes said there is more ospreys in the state than DNR wildlife staff know about and that the agency would like that information. The GPS backpacks fitted to the three osprey in July will transmit precisely where the birds fly and are expected to fall off after two to three years. All three of the ospreys were banded. “We’re excited to take any information we glean into the classroom and teach young students their story, about their recovery and migration. It is primarily an outreach tool,” Vaughn said. Young ospreys migrate south in the winter and do not return until their second year, Oakes said. Only 50 percent are thought to return to the nest. And only 20 percent of those survive long enough to breed. Ospreys reach sexual maturity somewhere between 2.5 and 4-years old. In southern Michigan the osprey population seems to be holding its own and doing well, now, according to Oakes. This entry was posted in Uncategorized and tagged American Tower Corporation, Birds, Birdwatching, Conservation, Detroit Zoo, Environment, GPS, Kensington Metropark, Michigan Department of Natural Resources, Osprey. Bookmark the permalink. Glad to hear hear this. I have been seeing Osprey’s on a more regular basis down on the lower Detroit River while I am walleye fishing. Is there a website so we can see where they travel too? mfs686: Thanks for your interest. There is an interactive map where you can follow the birds. The link is: http://owsem.org/html/gps_transmitters.html This may or not be the long-term host. More is being decided today. Stay tuned for updates on this story.